Steam escaping from my cup. So beautiful! Very similar in appearance to our buckeyes, aka horse chestnuts. Sadly, the buckeyes are inedible. Simply stunning, Merisi. Isn't God's work truly awesome! They do look similar to our buckeyes...after all, we are the buckeye state! It's a joy to discover your chestnut! Eternal sunshine in an autumnal (?) mind!! Beautiful photos of a fruit I love. you make simple things so beautiful, Merisi, thanks for sharing your gift! these are horse chestnuts, indeed! The top photo is the most beautiful one that I have ever seen. Seriously. The chestnut looks like a teak sculpture. What a talent! 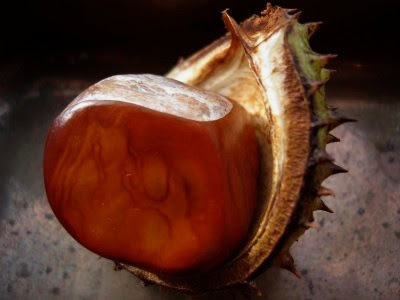 Conkers remind me of my Grandma's village and the fun we had collecting them from the big tree near home farm. Sigh.............memories. These are certainly the most beautiful photos of chestnuts I've ever seen! I've never actually tasted a chestnut...how has this happened? Don't see them here except perhaps at Christmas time. I'll have to buy some and experiment. Ah, those are so beautiful! 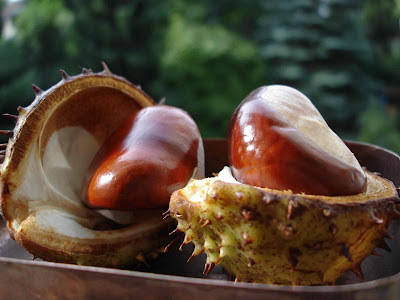 I adore chestnuts - but to look at their rich, glossy, tactile shapes and to eat. Wish they were more readily available in this part of the world. Artist of words and light, can I tell you this enough? Lovely. It's chestnut season over here as well. Wonderful photos! Very pretty close-ups of the chestnut! A, the chestnut. Along with the fig, this is to me one of the most gorgeous, sensual, and alien edible wonders of nature. Beautiful photos, Merisi. Hmmm..it's like peering into this precious gem being showcased in a museum.